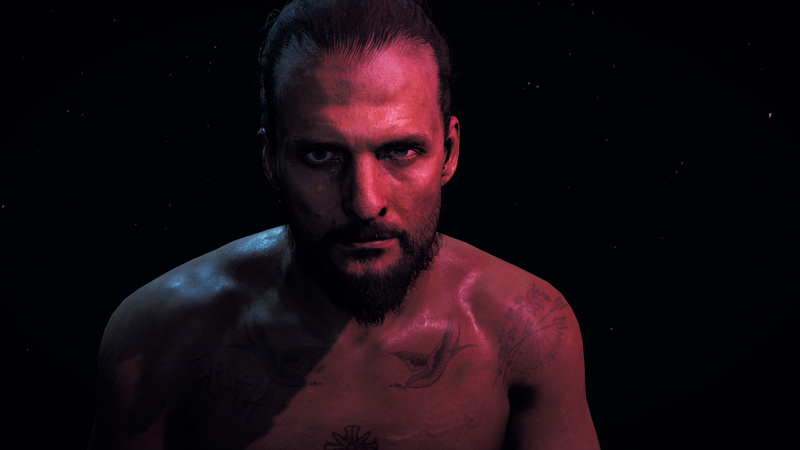 By the time my law enforcement colleagues and I arrived to take The Father, Joseph Seed, into custody, Hope County, Montana, had been consumed by his Eden’s Gate followers, known to the locals as Peggies. The situation was dire, and I felt a chill the first time I saw his compound. The Father, the game’s main antagonist, reminded me of David Koresh, who was the leader of the real-world Branch Davidians. It was a narrative tone that I wasn’t expecting, but it was welcome. 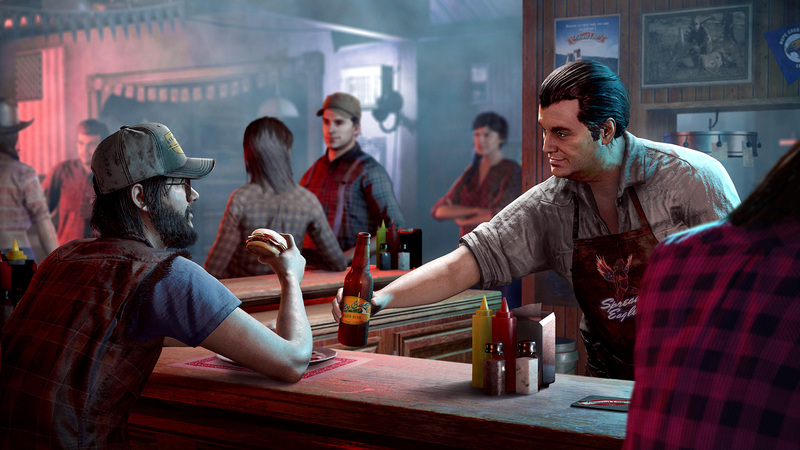 Soon, however, the unsettling mood set by the prologue gave way to the fast-paced, non-stop action that open-world Ubisoft games are known for. When I was eventually set free in Hope County, I spent about half an hour being introduced to the various concepts and mechanics of Far Cry 5. I found a prepper stash, had the chance to swim, used a zipline, and even hired an NPC to help clear the game’s first region, Dutch’s Island. Once through that, I was free to go where I wanted and do what I pleased. After clearing Dutch’s Island, I picked up a quest to liberate a lumber mill, so I set off on foot with my hired NPC fighter in tow. I generally don’t like to fast travel in open world games, but I didn’t even drive to this mission. My immediate goal was to get a feel for Hope County. It looked gorgeous on my PC in 2K, and I wanted to get lost wandering around the woods and mountains. The first thing I noticed beyond the beauty of Hope County were the sounds that brought the world to life. Be it the burst fire from assault weapons over the hill, the creepy voice of a cultist over the radio, or the hissing of a snake I couldn't see but knew was close, sound was as essential to survival in Far Cry 5 as it was to my enjoyment in the game. 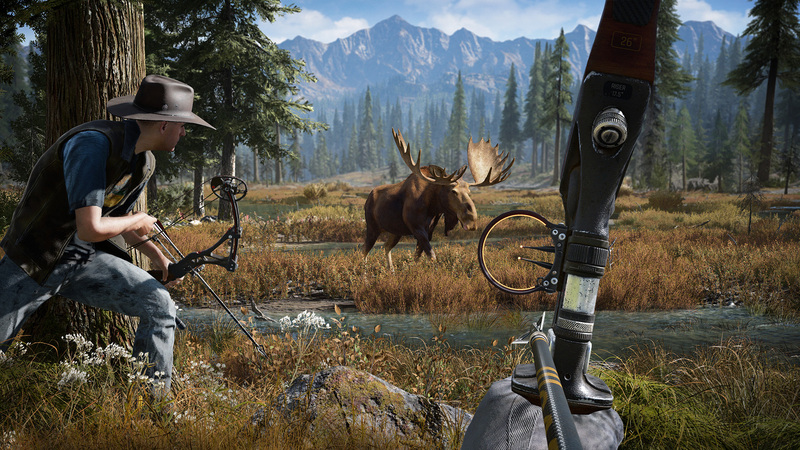 Unfortunately, the temptation to enjoy outdoor life in Far Cry 5’s stunning environment was contradicted by the density of the game’s dangers. I couldn’t go five feet without being fired on by Eden’s Gate, or mauled by a bear. This sometimes lead to hilarity, but there were few, if any, quiet moments in the early going where I could stop and enjoy the world. My first attempt to go fishing was met with violence, and hunting isn’t really hunting when you need an automatic rifle to defend yourself from your intended prey. I used both activities almost exclusively to earn money in the early going, but eventually I was swimming in cash and had no gameplay incentive to return to either. The lumber mill mission also turned out to be my first outpost, and those generally worked the same as they did in Far Cry Primal. Each one had numerous enemies, an alarm or two that needed disabling, and some loot and lore could be found once the baddies were gone. Liberating these outposts gave control of it back to the non-cultist citizens and opened it up as a base that I could operate out of. There was always a shop to buy guns, ammo, and items, and usually a vehicle bay or two. Liberating an outpost also presented additional side missions and allowed me to hire wandering NPCs to fight by my side. I enjoyed everything about outposts in Far Cry 5. The fighter I hired on Dutch’s Island helped me clear the first one, and I was pleased to see that I could give him orders with a single button press. If I tagged an enemy and then sent my fighter after them, he’d try to use stealth to take them out. We cleared the first outpost without being detected, and it was nice to see that the area was now back in the hands of the good folks of Hope County. The more outposts and locations I cleared, the less influence Eden’s Gate had, which led to a true feeling that I had liberated the region. As satisfying as clearing an outpost was, though, a major mechanic was missing. Far Cry 5 doesn’t have the option to go prone, and it worsened my experience with stealth gameplay. Ubisoft perfected going prone in Ghost Recon Wildlands and Rainbow Six Siege, and I think that made the lack of a prone mechanic here sting even more. I realize it wasn’t an option in previous Far Cry games, but I don’t get the design decision. Prone notwithstanding, combat was enjoyable. I used a DualShock 4 controller even though I was on PC, and I never took issue with the button layouts, even with vehicles. The control scheme always felt intuitive, and this helped to keep the flow of combat moving. I was never fumbling around trying to figure out what to press. Switching weapons and tossing explosives was effortless, and all of this tied into the weapons and perks in Far Cry 5. Getting weapons and gear in Far Cry 5 wasn’t satisfying. Beyond the Compound Bow I found during my time on Dutch’s Island, everything was purchased through vendors. I felt robbed of the need to look for a sniper rifle or assault rifle. Gear acquisition became boring. Some weapon upgrades were locked behind progression, which was fine, but for the most part I found the system unrewarding. Even finding the bow was less exciting once I realized I could have just paid for it. Perks also fell a bit flat for me. There were a few that were useful, such as the Grappling Hook or Lockpick, but beyond that most were forgettable. When I finally finished with everything I wanted to do I was only missing a couple, and I didn’t bother to read their descriptions before spending the points to unlock them. Earning the points to unlock the perks was the best part of the system for me. Perk magazines (each worth one perk point) could be found in prepper stashes and unlocked through gameplay. The few times I needed a perk I knew I could quickly earn the required points by catching a new fish or using a weapon I’d been ignoring. Perk points were also awarded for kills that fighter and specialist companions racked up, which pushed me to give each one a try. 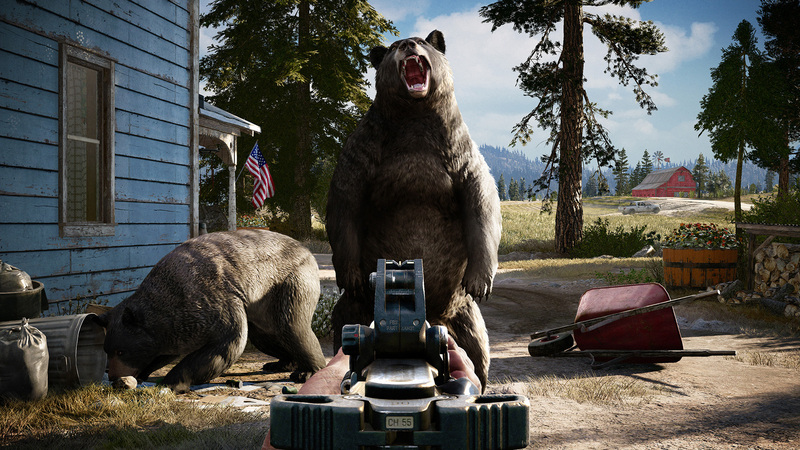 Fighters and specialists enhanced the combat experience of Far Cry 5. The former are regular NPCs that you bump into. They each come with two unknown perks that are revealed and unlocked after they get a certain number of kills. They can be hired or let go as desired, and you can have three on your roster at any one time. I ended up with two I found useful, but the third spot became a revolving door of fighters who didn’t fit in. Since I could mix and match specialists and fighters, and can only ever bring two at a time, this wasn’t a huge deal. The main appeal of a companion was the violence they brought to the table. In the early hours of my playthrough I would take Jess and Boomer with me. 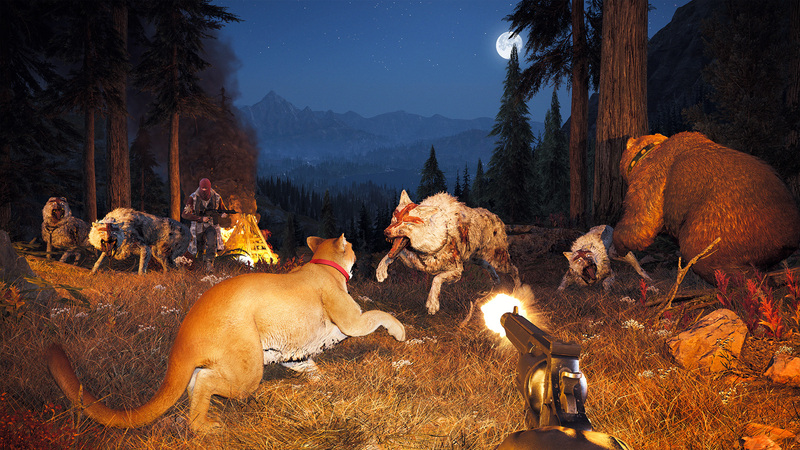 Boomer (the dog) would mark enemies, and Jess (killer with a Compound Bow) would take them out silently. It worked well with my preference for stealth, and it was also effective for hunting wildlife. Slowly, though, I found myself preferring to travel Hope County by helicopter. I grew tired of violent encounters every few steps and used air travel to avoid distraction. This is about when I switched to Nick and Adelaide as companions. Nick flew a plane and could strafe or drop bombs, and Adelaide provided the comedic tone and overwatch in her chopper. Together, we decimated Peggies and could clear outposts and missions in minutes. This built up the resistance in each region and progressed the story at a good pace. The concept of clearing out Peggies and building a resistance in each region worked well. What didn’t work was how often Far Cry 5 interrupted me and dragged me into a story mission. The moment I would level my resistance in an area, one of the Seed siblings would capture me, ripping me from whatever I was doing. Once I could handle, but this occurred half a dozen times. It annoyed me enough that I logged out after leveling my resistance one night. I was exploring prepper stashes and had no desire to be dragged into another mission at that moment, so I put the game down in frustration. It wasn’t that I didn’t find myself invested in the narrative, but collectibles and getting into prepper stashes were my favorite parts of Far Cry 5. Prepper stashes were usually bunkers that required me to solve a small puzzle to gain access. I was addicted to these from the moment I realized they existed and managed to find each prepper stash long before beating the game. My only issue was the use of waypoints everywhere. There was one prepper stash that gave me a waypoint that said “Find.” That sort of sucked the fun out of things. I did discover that I could tweak the HUD and gameplay settings, but this was long after it would have helped me. Some prepper stashes, bunkers, and buildings in Far Cry 5 reminded me a bit of Fallout 4. In that game, each destination told a story that I could easily overlook if I wasn’t taking my time. Far Cry 5 had the same feel at times, which is the highest compliment I could give it considering how much I enjoyed Fallout 4. I’d often find that, when I slowed myself down and really paid attention, there were stories being told in Hope County that I could have just as easily walked right past. Hope County was full of lore, but I often found myself too busy ticking the boxes on the waypoint checklist to notice. Far Cry Arcade was the last mode I tried. I loved the idea of designing single player, co-op, and PvP experiences with assets from previous Ubisoft games. However, I was quickly overwhelmed with what was before me and lost interest in building anything. This was more a reflection of my lack of creativity, though. The concept of building new gameplay levels and scenarios by using thousands of assets is interesting, and it could add longevity to Far Cry 5. Next, I jumped into some Far Cry Arcade PvP. Through my five or six games, I was underwhelmed by what I found. Weapon loadouts were limited, the gameplay didn’t stand out from anything I’d played in the past, and I couldn’t find a reason to want to return. It could have been fun with friends and chatting on the mic together, but I played with random gamers. Nothing about the PvP experience sold me on coming back to it. PvP just doesn’t interest me much these days, and nothing in my rounds of PvP threatened to pull me back to it. I’m a co-op man at heart, which brings me to my biggest complaint. Co-op in Far Cry 5 was amazing to play but terribly implemented. I loved playing with a friend and seeing how combat evolved. I recall cruising down the road, him driving and me hanging out the window with a baseball bat, crushing the face of anything that got close. It was mailbox baseball with a twist, but the fun in co-op never stopped as long as we were insane enough to try something. The problem was when I left his game and returned to my own. I kept my perks, cash, and weapons, but story progression was lost. We probably went through a dozen missions, only for me to return to my game and have to do them all again. How this slipped by the game’s designers or was considered a good idea is beyond me. Co-op was the single most anticipated feature for me leading up to Far Cry 5, but I began avoiding it because I didn’t want to repeat quests in my own instance. Far Cry 5 was a good game that could have been great. Had Ubisoft not been so concerned with holding my hand, or overwhelming me with clutter to keep me from getting bored, Hope County would have gone down as one of the better open worlds I’ve stepped foot in. The game’s narrative was a great idea that turned out better than I expected, but the value for me with an open world will always be in how much I enjoy existing in it. How motivated am I to explore and discover? With Far Cry 5, there were hints of that, but all too often I was shown the answers. This left me feeling slightly robbed of how I experienced things. At the same time, Far Cry 5 met all my expectations for exciting combat and hilarious moments. Whether grappling from my helicopter because a random NPC jacked it, or hearing Adelaide discuss why she stocked up on olive oil before Eden’s Gate took over, there were more moments of hilarity and brilliance than not. 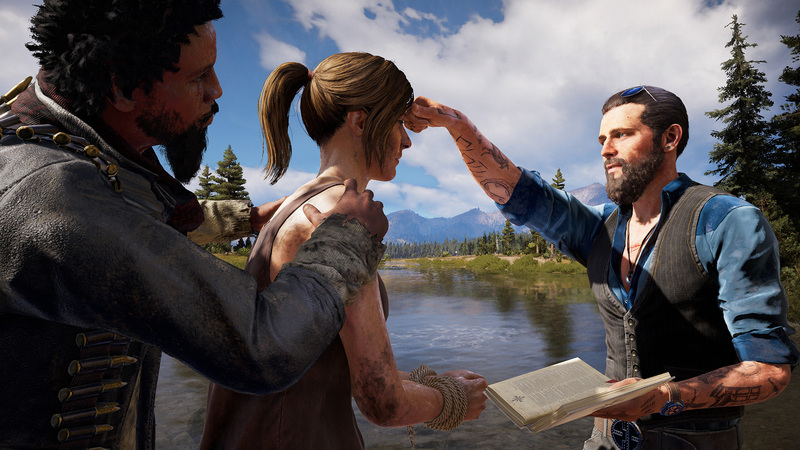 A few things missed the mark that shouldn’t have, but I generally got what I expected from Far Cry 5; a fun, open-world game worth the price tag and not to be taken too seriously. It really doesn't sound like enough has changed or improved to make me want to dive into another Far Cry game. Really? This is the best one in the series, no question. I haven't read that review, but everyone I've heard from has loved it. Well, in reality much has not changed or improved. It's just a neat, well executed package. In general, a person who does not enjoy FC games will not enjoy this one, nor will a person who is burned out on the formula. This is coming from a fan of the series who DOES think 5 is the best of the bunch, but that doesn't make it worth 60 bucks. It's pretty safe as far as sequels go. Agreed, it's more of the same (not that that's a bad thing). I definitely fall into the burned-out category. I have Far Cry 5 and Arse->Arse Creed Origins...I keep going back to Origins. I'm playing through the Ass2AssRogue remaster and will wait until the price for FC5 drops. I haven't played that yet. I feel like when I get some down time from games to play I should put some effort into that. Primal was pretty bad. This feels much better. But it fails to step into the elite open-world games category like The Witcher 3, BoTW (I'm told), or Fallout 4. Man that is a motley crew of games. FC5 is nothing like the Witcher or BotW and Fallout 4 doesn't deserve to be in the conversation. 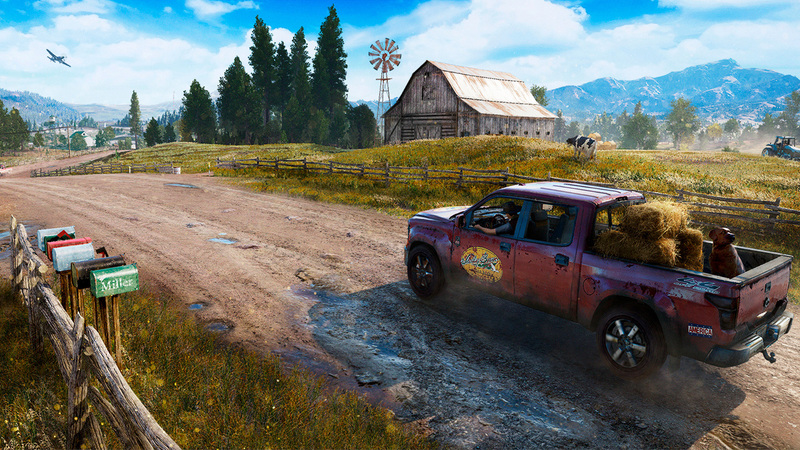 FC5 is simply a more refined version of FC3/4 in a brand new setting. Every Bethesda game is going to be in a conversation of open world games whether you recognize it or not bill. So why *did* Adelaide stock up on olive oil? I started the game by turning all hud options off, then quickly turned it back on, maybe doing that turned off a tutorial? I'm with you on a lot of the lack of progression and discovery when it comes to mechanics. After the first few hours you never find new weapons, you only buy them, and there are few upgrades or even significant variations within a category.